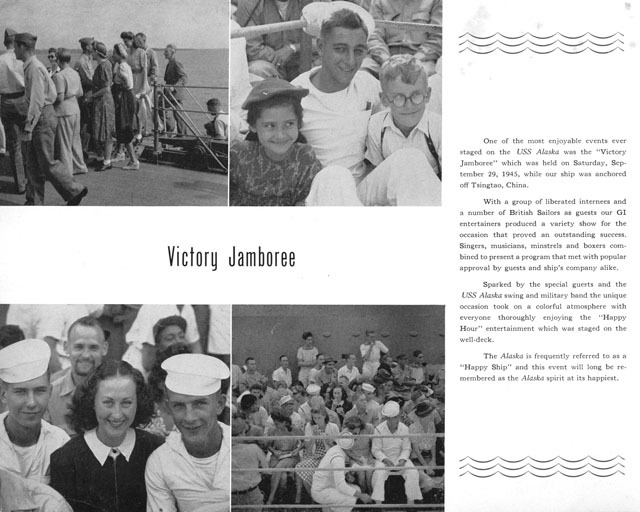 One of the most enjoyable events ever staged on the USS Alaska was the "Victory Jamboree" which was held on Saturday, September 29, 1945, while our ship was anchored off Tsingtao, China. With a group of liberated internees and a number of British Sailors as guests our GI entertainers produced a variety show for the occasion that proved an outstanding success. Singers, musicians, minstrels and boxers combined to present a program that met with popular approval by guests and ship’s company alike. Sparked by the special guests and the USS Alaska swing and military band the unique occasion took on a colorful atmosphere with everyone thoroughly enjoying "Happy Hour" entertainment which was staged on the well-deck. The Alaska is frequently referred to as a "Happy Ship" and this event will long be remembered as the Alaska spirit at its happiest. I served 2 and a half years on alaska i am now 88 I have the book that the crew received from the state of Alaska . is there any chance you would remember a radioman Bruce Simon (Alden Bruce Simon) latter part of 1945. I am his sister and just found this website.